A small organic farm in the Hawke’s Bay, Sentry Hill strives for quality without compromising the happiness of the animals. Their produce is a reflection of years of hard work by the White family to consciously create the best environment for their cows, sheep, pigs, dogs, chickens — and even bees — from the soil up. It’s a true labour of love to bring their products to a commercial market and they needed their branding to show the dedication and care that goes into the produce. Our team got to work and created a herd of loveable farm animals as Sentry Hill’s brand ambassadors. The unlikely, eye-catching new brand ambassadors — a sheep, cow, pig and chicken — each has their own distinctive and endearing personality and appear throughout packaging, print and online. As Sentry Hill grows so will the illustrated farm! Sentry Hill strives to minimise waste in all ways, so it’s important that customers can return their jars without having to scrub off an overly sticky label. 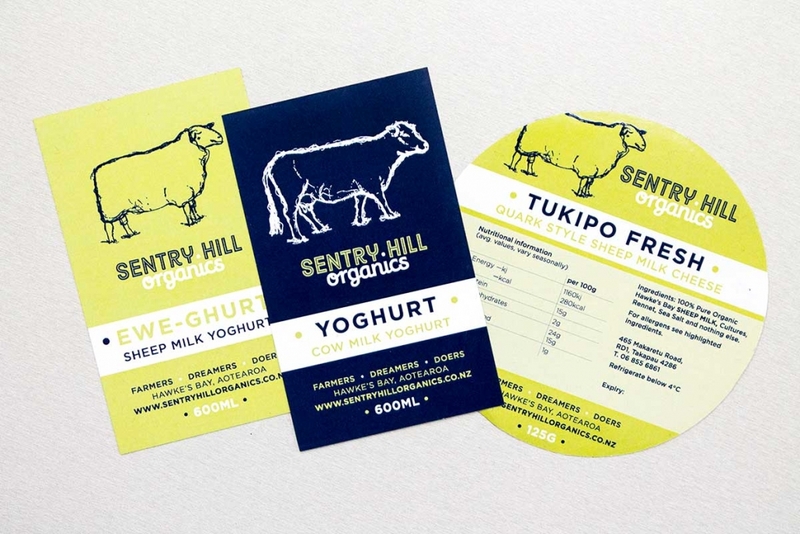 We developed a clever swing tag and freshness seal for Sentry Hill’s glass yoghurt jars, both of which are easily removable to encourage recycling or reusing. We employed the colours blue and green to stand out on cluttered shop shelves and developed labels for the top of yogurt and cheese containers for both retail customers and commercial customers. Sentry Hill is already gaining all kinds of attention. They’ve even been spotted at the NZ Cheese Awards and and gathered a number of well deserved winners’ ribbons. We’re so happy to help this wonderful little brand. Great packaging design makes all the difference! Carrying your brand across a product range goes much further than just slapping your logo on something. We can really make it yours. Talk to us about how to get top shelf design.